The union representing UC workers, AFSCME Local 3299, entered negotiations with the university Wednesday over a new contract, and several union members and other protesters demonstrated for better benefits near Sproul Plaza. AFSCME is a nationwide union that represents employees in local and state government and in the health care industry, and Local 3299 represents patient care and service employees at all university campuses and buildings. At the protest, a group of UC Berkeley workers and students held signs, walked in a circle and chanted while others passed out flyers outlining the union’s views. According to the flyer, the union is pushing for job security, benefit protections, fair wages and workplace rights. 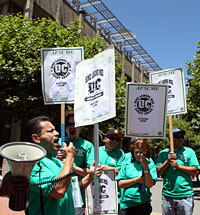 Rivera said the union wishes to have the service and patient care employees bargain together for a new contract. However, the university is seeking for the two groups to negotiate their contracts at separate times because they do different jobs and combining unions has not worked in the past, according to UC spokesperson Dianne Klein. The Berkeley demonstration was part of statewide AFSCME protests held at the UC Davis, Santa Cruz, San Francisco and Los Angeles campuses. Luis Bocaletti, a Local 3299 staff organizer who was at the protest, pointed out that the two groups had bargained the last two contracts together. “We’re one union, and we intend to bargain together,” Bocaletti said. The union and the university last agreed on a new contract in October 2011. According to the contract, both service and patient care employees will receive a 3 percent pay increase in 2012. The contract will also continue to provide health care benefits and pension payments for all employees. After the October negotiations, Julian Posadas, then-Local 3299 executive vice president, said the union was happy that the university was willing to commit to what they bargained for but was disappointed over the lack of sustained wage increases. CalServe senator and UC Berkeley senior Nolan Pack observed Wednesday’s protest and said the union was doing really valuable work at the protest. He pointed out that when budget cuts come, the workers are often the first to be affected, but they are often forgotten by the students and other groups. Eugene Stokes, a campus senior building maintenance worker, was the chant leader at the protest and stood in the middle of the circling protesters and called out chants that chastised the university and rallied union support.